When the Finishing Touch Flawless Facial Hair Remover came out, I did a review on that item. I loved it and still do. I use it all the time. Well, they recently came out with two new items, the Finishing Touch Flawless Legs and Finishing Touch Flawless Brows. Today I will be reviewing the Flawless Legs, because let's face it, I don't have much in the brow department to remove. I have to apply my brows daily due to a teenage mishap of removing too much hair and it not growing back. 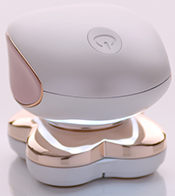 What is so wonderful about the Finishing Touch Flawless Legs is that it has four floating 18K Gold plated heads, it's well lit with LEd lights for you to see what you are doing, you get four times more coverage than with razors alone, it has a USB port to plug in and charge your Finishing Touch Flawless Legs so that it charges quickly and economically and you can rotate the heads around your legs easily to avoid nicks and cuts that you would normally get with a razor. This one just slides around the legs. It not only works on the legs but also removes hair on the arms, underarms and the bikini area too. I have used it with all areas successfully. You do not get any nicks, cuts or irritation from the hair remover. Also, no need for soap, water, hair remover oils or gels, just your skin and the device. It does include 1 AA battery that lets you take it on the go with you and is rechargeable. The best thing? It is small enough to fit in the palm of your hand. It even comes with a black velvet carrying back that allows you to fit the device, the charger, and a small cleaning brush that comes with it. It's perfect for travel. This is something you can take with you anywhere. I ADORE this product and will never go back to shaving. NEVER. I don't have much hair on my legs after I lasered it off with a TRIA laser, but I still have some and removing it is not easy. But this does it quickly and easily without any muss or fuss. Plus, as I mentioned, I can do my bikini area which makes it so much quicker than shaving. The Finishing Touch Flawless Legs retails for $59.98 and can be found online at www.ftflawlesslegs.com, www.amazon.com, and in Bed Bath and Beyond stores. This item makes a great holiday gift for the woman in your life. I mean any woman would appreciate something like this. I know I would. Hair removal is a tough subject to approach, so don't just hand your wife this and say "Hey, I thought you might need this." Say, "Hey, I wanted to make your life easier."